The Cat® Skid Steer Loaders are designed, built, and backed by Caterpillar to deliver exceptional performance, versatility, ease of operation, serviceability, and customer support. Caterpillar has also developed a wide range of performance matched work tools to meet customer needs. Cat® Work Tools are machine matched to Cat Skid Steer Loaders and carry with them Caterpillar's proven reputation for performance, durability, and reliability. The highly versatile combination of Cat Skid Steer Loaders and Work Tools fill needs in Agriculture, Construction, Forestry, Industrial, Mining, Quarry/Aggregate, and Waste applications. 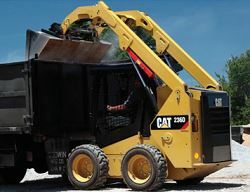 The CAT Rental Store at Kelly Tractor Co. has the Caterpillar backhoe loaders, dozers, excavators, graders, rollers, and other construction equipment and tools you need to complete your project or job. We have rental locations in Miami, Davie (Ft. Lauderdale), West Palm Beach, Clewiston, and Fort Myers. Please Contact us at 305-592-5360 for more information! About Us | Contact Us | ©2019 Kelly Tractor Co.